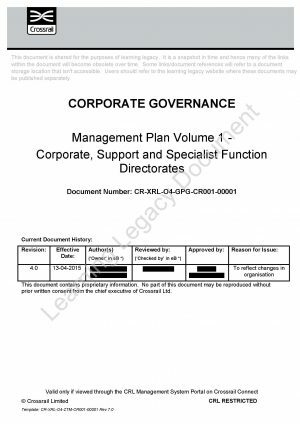 Documents the governance arrangements and references corporate function, support function and Programme specialist management plans. Mandates how the Crossrail Central Section Delivery Directorate manages the Central Section which comprises of the Central Section Works by contractors engaged directly by Crossrail and other works by Delivery Partners. Invoking appropriate function support plans, processes and procedures (mandated in corporate and programme support directorate management plans) and augmenting them with appropriate Central Section Delivery specific processes and procedures and referencing the Construction Management Plan, Construction Quality Plan and Project Construction Execution Plans. Mandates how the Crossrail Surface Directorate manage the Surface Works which comprise the On Network Works undertaken by Network Rail and other work by contractors engaged directly by Crossrail. Invoking appropriate function support plans, processes and procedures (mandated in corporate and programme support directorate management plans) and augmenting them with appropriate Surface Delivery specific processes and procedures and referencing supporting plans. The Operations Management Plan describes elements of the Crossrail project for which the Operations Directorate is accountable, including the delivery of the Rolling Stock, Depot and associated Services and working as RfL’s agent to manage the delivery phase.